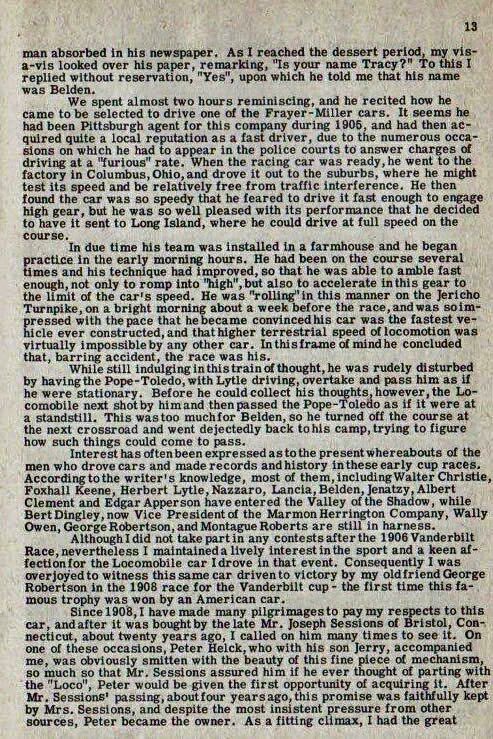 Walter notes the article "gives a lot of insight and details from the Vanderbilt Cup Races". Below are the highlights of the article supplemented by images from my collection. To those unsung heroes who clung grimly to the mechanicians' seats, who, without hesitancy but with utter confidence, placed their lives in the hands of their drivers, and whose names were seldom mentioned, except in the casualty list, these reveries are affectionately inscribed". 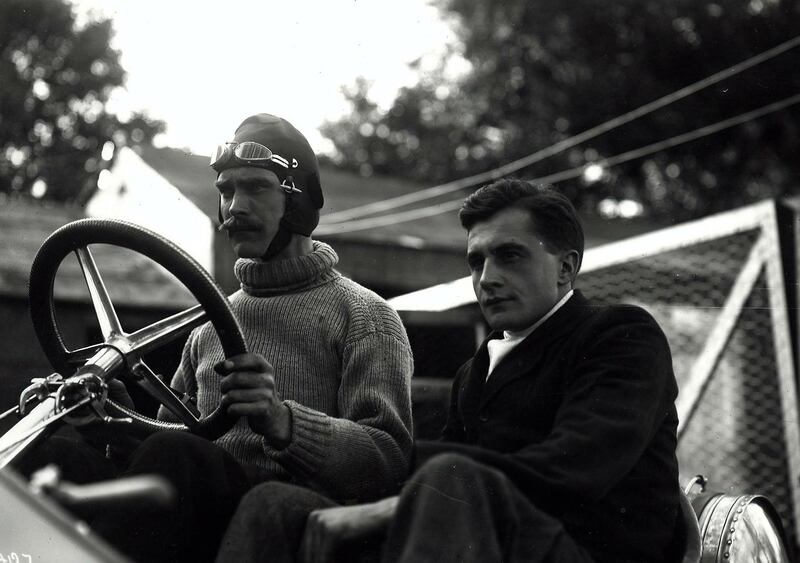 "Having developed a taste for speedy driving as a result of initial experiences with motorcycles and cars,...I looked about for a mount to drive in the first Vanderbilt Cup Race on Long Island in 1904." "Practice for the race was limited, as the car was not ready until a few days before the date of the event. 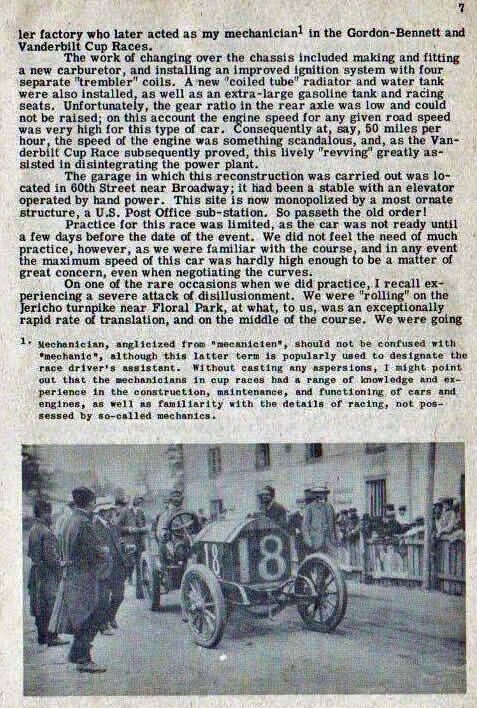 We did not feel the need of much practice, however, as we were familiar with the course, and in any event the maximum speed of this car was hardly high enough to be a matter of great concern, even when negotiating the curves". "...we were at the white line, awaiting the voice of fate in the guise of the starter's staccato command, "Ready, you have 10 seconds,9-8-7-6-5-4-3-2-1- GO!" 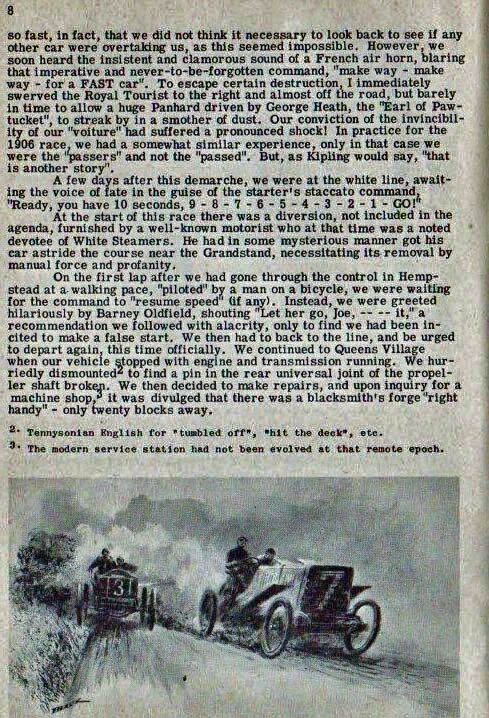 "On the first lap after we had gone trough the control in Hempstead at a walking pace, "piloted" by a man on a bicycle, we were waiting for the command to "resume speed" (if any). Instead, we were greeted hilariously by Barney Oldfield, shouting "Let her go, Joe,-- -- it,", a recommendation we followed with alacrity, only to find we had been incited to make a false start." 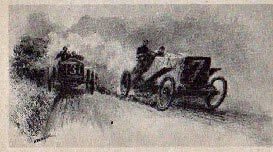 "To escape certain destruction, I immediately served the Royal Tourist to the right and almost off the road, but barely in time to allow a huge Panhard driven by George Heath, the "Earl of Pawtucket", to streak by in another smother of dust." 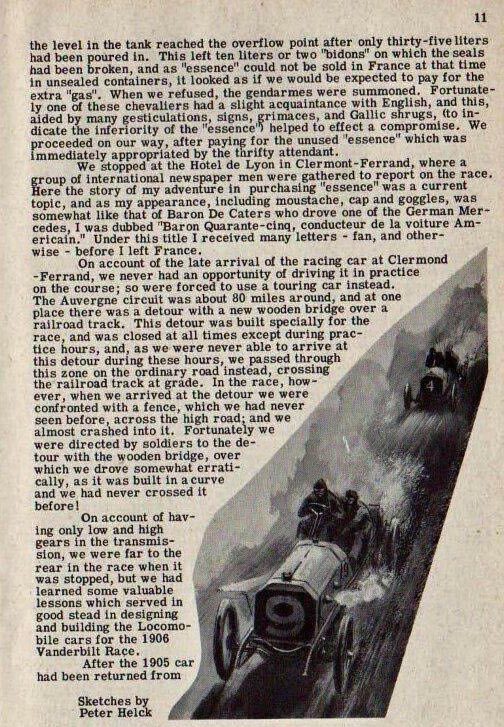 "When it was found impossible to continue in the race..I left the car in charge of my riding mate, Alfred Poole, and called his attention to a godly supply of chocolate planted under the seat cushions as emergency rations." 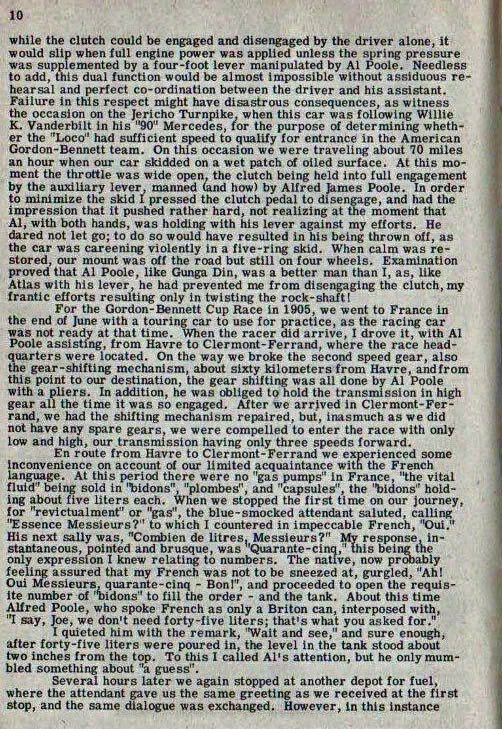 "I rode to the Grandstand in a friend's car to report to Charley Duerr, and found him rather despondent. Taking me aside, he intimated that I drove entirely too fast, and that, if I had gone SLOWER, I would have won hands down, as the fast pace had resulted in wrecking the engine. He sagely concluded, "There is moderation in all things!!" 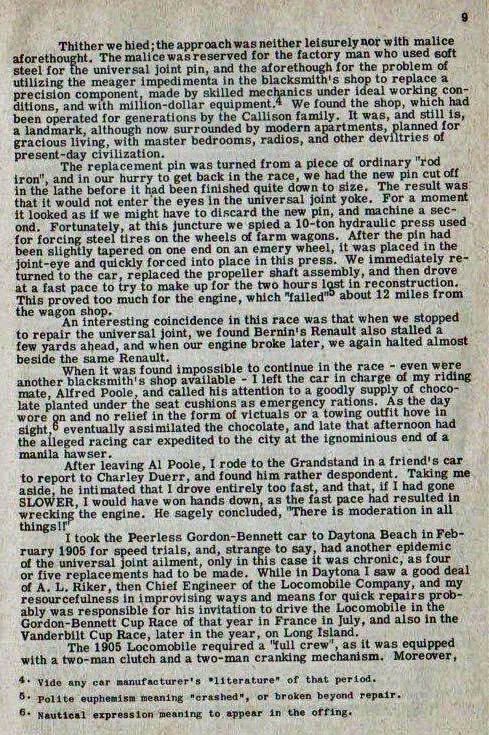 "While in Daytona I saw a good deal of A.L. 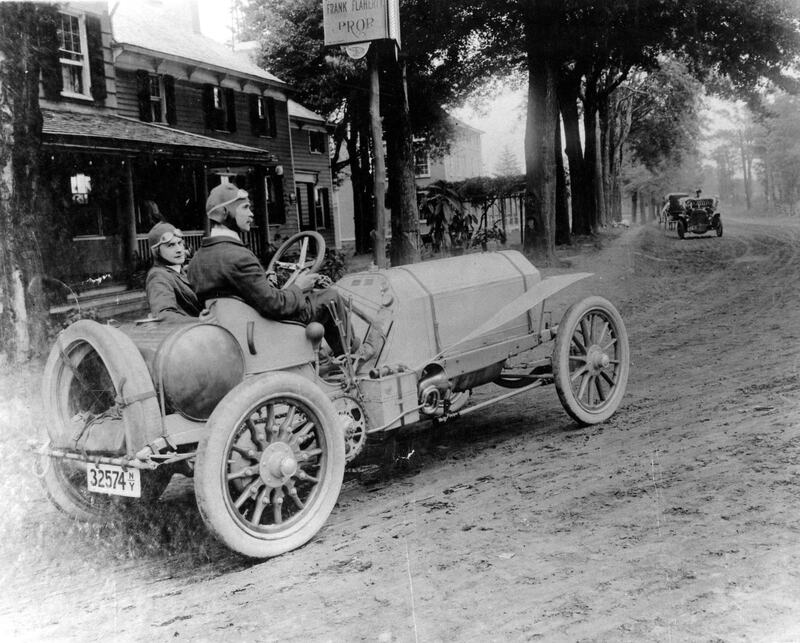 Riker, then Chief Engineer of the Locomobile Company, and my resourcefulness in improvising ways and means for quick repairs probably was responsible for his invitation to drive the Locomobile in the Gordon-Bennett Race of that year in France in July, and also in the Vanderbilt Cup Race, later in the year, on Long Island". 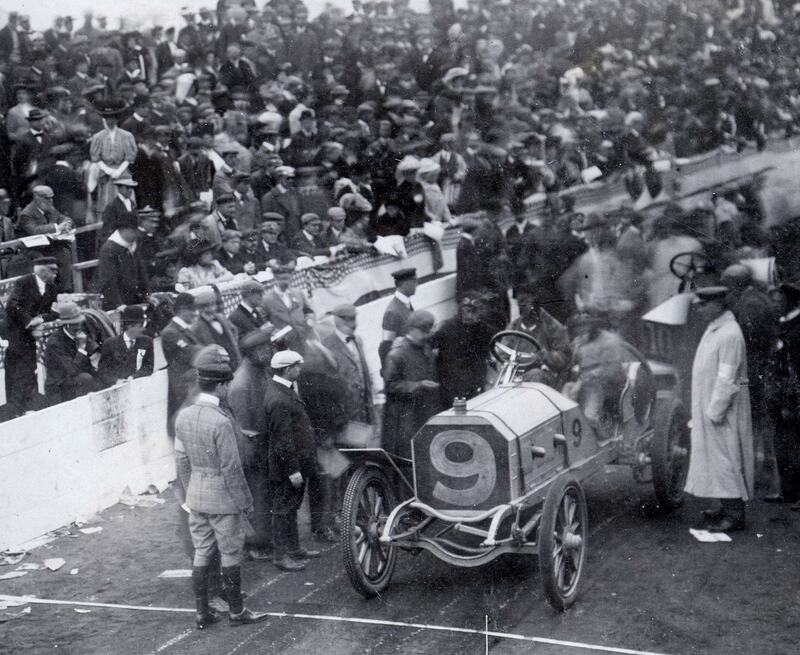 "After the 1905 car had been returned from France, It was received at the factory in Bridgeport, completely overhauled and put into condition for the elimination and final races for the Vanderbilt Cup". 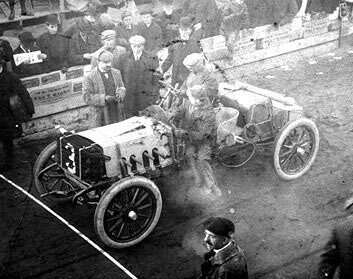 "It ran well in the elimination race, coming in second to a Pope Toledo driven by Bert Dingley". 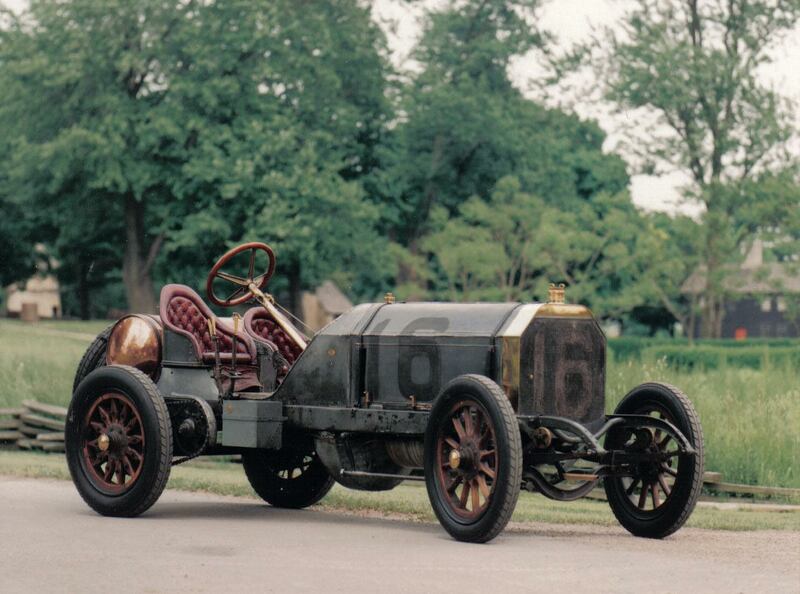 "A cracked cylinder the day before the 1905 final almost prevented the Locomobile from running in this race. However with a full force working all night, new cylinders were mounted, the work being finished barely in time to enable us to get the car to the starting line only a few minutes before the race began." 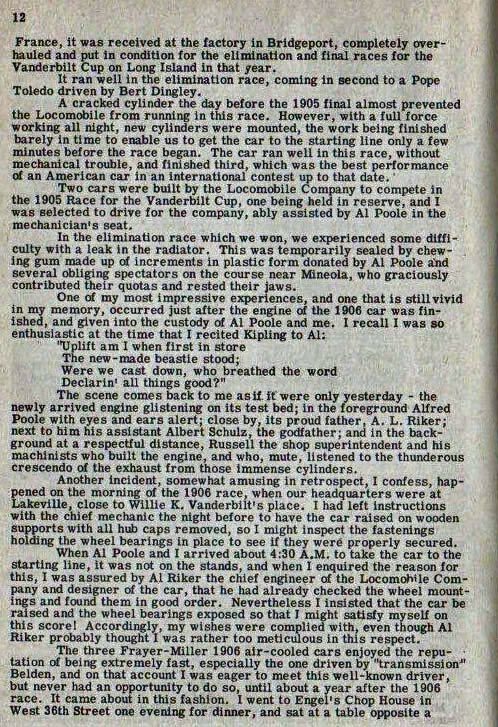 "On account of having only low and high gears in the transmission, we were far to the rear in the race when it was stopped, but we had learned valuable lessons which served in good stead in designing and building the Locomobile cars for the 1906 Vanderbilt Cup Race." 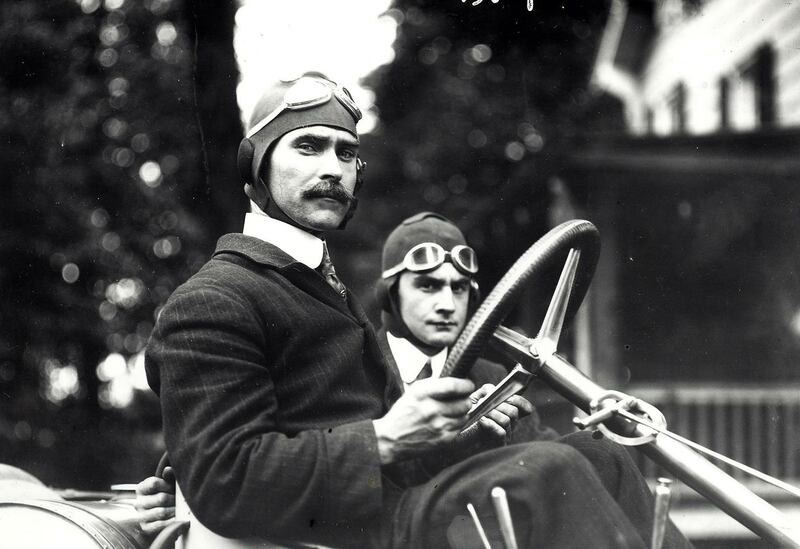 "Two cars were built by the Locomobile Company to compete in the 1906 Race for the Vanderbilt Cup Race, one being held in reserve, and I was selected to drive for the company, ably assisted by Al Poole in the mechanician's seat". Note: Article incorrectly references the 1905 Race. 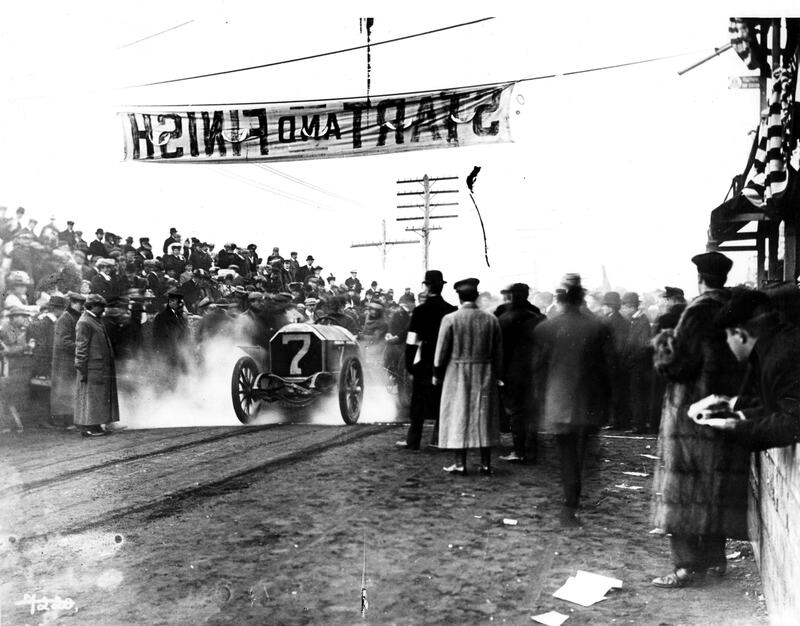 "Interest has often been expressed as to the present whereabouts of the men who drove cars and made records and history in these early cup races. According to the writer's knowledge, most of them including Walter Christie, Foxhall Keene, Herbert Lytle, Nazzaro, Lancia, Belden, Jenatzy, Albert Clement and Edgar Apperson have entered the Valley of the Shadow, while Bert Dingley, now Vice President of the Marmon Herrington Company, Wally Owen, George Robertson, and Montague Roberts are still in harness". 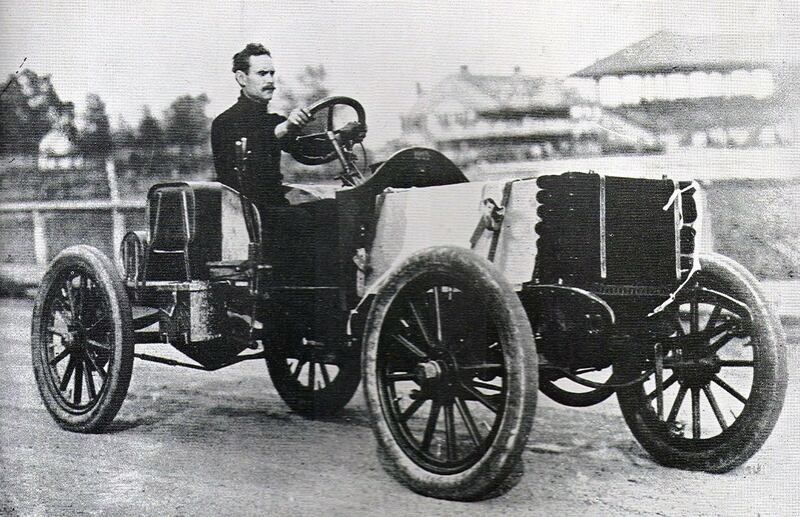 "Although I did not take part in any contests after the 1906 Vanderbilt Cup Race, nevertheless I maintained a lively interest in the sport and a keen affection for the Locomobile car I drove in that event. 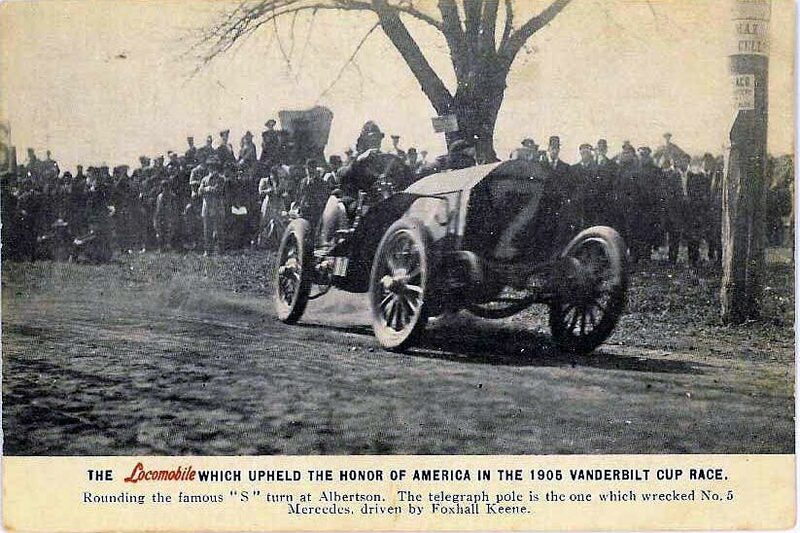 Consequently I was overjoyed to witness this same car driven to victory by my old friend George Robertson in the 1908 race for the Vanderbilt Cup Race- the first time this famous trophy was won by an American car." "Mr. Sessions assured him if ever thought of parting with the "Loco", Peter (Helck) would be given the first opportunity to own it". 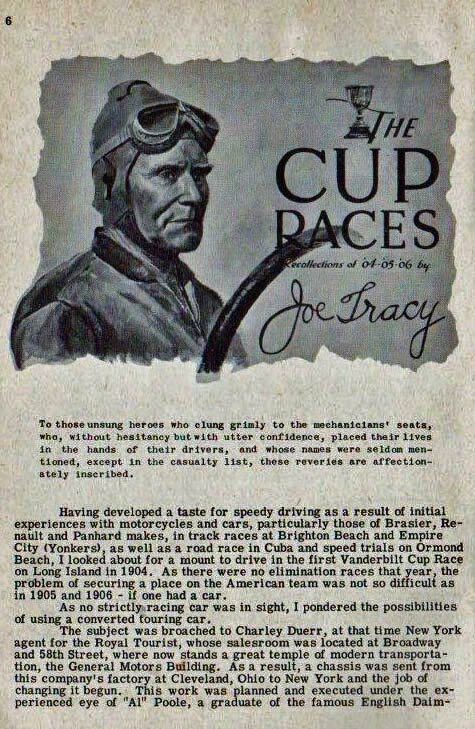 PDF of Article "The Cup Races" by Joe Tracy (allow one-minute for the download).